"I am my beloved's and my beloved is mine" is the famous quote on the Ketubah that I wanted to powerfully express in Jewish wedding photos. The words wrapped around the page like a crescent moon and they fit perfectly in the frame of the photo. The font is blurred enough to encourage the viewer to lean into the image, turn their head, and observe the vintage Ketubah design with its rustic pages and thin floral borders. The bride and groom smile and listen to the Rabbi read the Ketubah in the out of focus background because I want focus on the "beloved" quote. 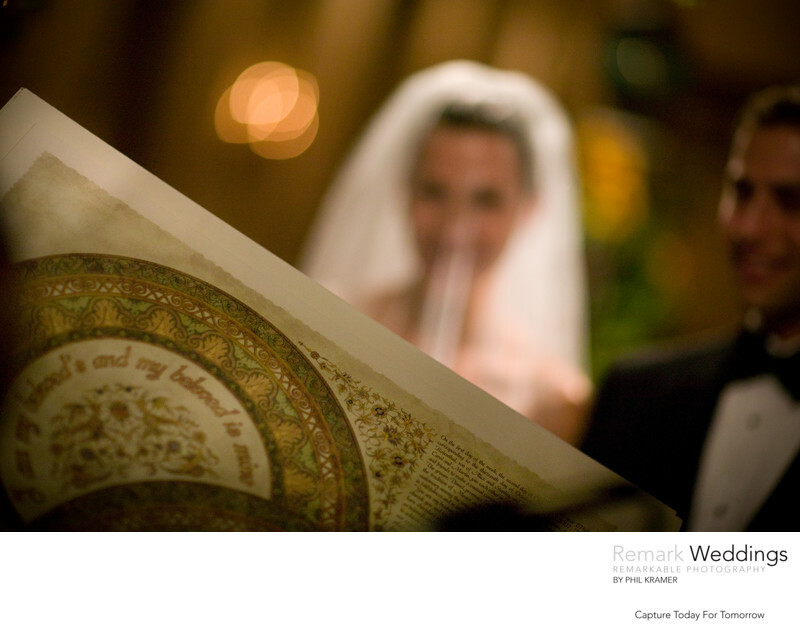 The eye naturally looks at the distortion in the background, discerns that it is a bride and groom, and returns to the Ketubah page. Instead of photographing the Ketubah separately from the bride and groom like most photographs of wedding objects, I combined the two and tweaked the focus to capture the couple's subtle happiness at the podium. "I am my beloved's and my beloved is mine" conveys the essence of Jewish marriage and the acceptance of love. The scripture is in the corner of the image, which allows other shadows and details to attract the eye. Location: 200 S Broad Street, Philadelphia, PA 19102.